Put your trust in a service in Stepney with a rating of over 96%! A: Your panes will be polished by a team of certified and reference-checked window cleaning specialists. Q: What services does window cleaning Stepney provide? 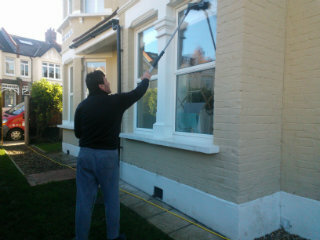 A: The cleaners will carry out exterior window cleaning with the help of present-day water-fed pole gear on the market. For premises above the fourth floor, we'll dispatch experienced abseilers for rope access window cleaning. For interior pane polish, the team will use standard ladders and squeegees. A: A couple of of raindrops won't undermine the Stepney window cleaners' work – rainwater is usually mud-free. However, if we face a cloudburst, then we will kindly ask you to re-schedule your appointment for another day. A: As long as the cleaners can walk past your front gate, they can blast away all muddy streaks without you having to be close by. If your panes need a proper interior polish as well, then we'll carry out a quick key pick-up and delivery service. A: Usually, the purified water container inside the team's cleaning vehicle is always full. In case the tank is empty and with your consent, the technicians can easily link the water-fed pole to any accessible water source. A: Once we tell you that the team's en route, you'll need to ensure that they can enter your domain unimpeded. In addition, the specialists will require a parking space within 30 metres from your property and on the same side of the windows you want cleaned. A: If the team is nowhere to be seen because of intense traffic, we will tell you about the setback and get in touch with you as soon as they arrive. With the efficient water-fed rod gear, the professionals can help you overshadow your competition at fair prices. And you can press down our window cleaning Stepney rates even further by combining two or more of our cleaning services together! To learn the exact amount behind our price offers, make sure to stop by our handy price table below. No matter where your smudges have taken refuge, our resourceful window cleaning in Stepney will eliminate them with ease. We have covered various washing methods. Our exterior window clean is aimed at properties that do not exceed four floors. To let the sunshine back inside, the window cleaners in Stepney will come in a vehicle, supplied with a retractable water-fed rod. This gear is connected to a water tank, filled with purified water. After being released as a powerful stream from the pole's brush-head attachment, the water will erase all dust build-up in an attempt to restore its previous structure. To reach muddy window corners of high-rise buildings, we'll send a seasoned team for rope access window washing. These certified climbers will use well-maintained ropes and harnesses or position ladders and cherry pickers to renew the glamour of your panes. We've got all essential COSHH documentation in place and follow every safety rule and regulation. To make the in-house side of your glass façade just as glossy, the pros will depend on the established ladder and squeegee cleaning method. As we received more and more positive responses from our customers, the need for window cleaning in Stepney has noticeably skyrocketed in adjacent areas. You can check the locations we've added in the list below. For those of you who'd rather book window cleaning services Stepney E1 online, fill in our get a free instant quote form.